The NEW Wireless TZ350 provides advanced threat prevention to branch and small office networks. SonicWall's Wireless TZ350 appliance delivers high-speed performance and advanced threat prevention to secure small networks. 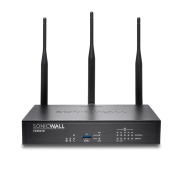 The wireless SonicWall TZ350 delivers integrated 802.11 a/b/g/n wireless and operates on SonicOS.